We agreed by posted decision consensus to approve the following ST slate: Barry Goldberg, Han Bishop, Katie Waller, Julie Goodman, Carin Garcia and Beth Walker (as HOA Treasurer). CFT is to begin a new community recycling pick-up service for up to $140/mo. For 2018, the service will be paid for with an allocation from Contingency funds of up to $1540. The exact amount will be determined based on final cost of the service and number of invoices to be paid in 2018. Carin will depart the current steering team and Mac and Zita will join the team. The Steering Team will consist of Barry, Julie G, Han, Katie, Mac and Zita. This team will serve until the normal rotation time at the beginning of 2019. Heartwood Cohousing will be developed in two phases, the first phase having been already completed. Phase 2 will be designed and built in a manner consistent with the Phase 1 cohousing model. Phase 2 will be fully integrated into Phase 1, forming a single community. Phase 1 has paid Mac and Sandy $246,300 for Phase 1’s 24 lots and share of the land. Mac and Sandy have paid $418,700 for Phase 2’s share of the land. To make the arrangement equitable for both Phase 1 and Phase 2, Phase 1 has paid for the Common Facilities listed below in the Common Land and Facilities section. Mac and Sandy will be the developers of Phase 2. They will pay the costs (not otherwise identified in this agreement as being the responsibility of Phase 1), take the financial risk related to those expenditures, and keep the financial profits (or losses) related to the Phase 2 development. Phase 1 members will also bear risk related to the Phase 2 development due to uncertainties of the costs they are responsible for, the impact on real estate market values, and other possible unknowns. The community will work with Mac and Sandy to revise the covenants as needed to make them consistent with this agreement and all of our community agreements to the extent legally possible. They will also create HOA by-laws as needed. A Covenants Revision Task Force will be formed for this work. It is unknown when or how many times the covenants may need to be revised during the Phase 2 development process. All costs associated with revising the covenants and creating the by-laws will be allocated between Phase 1 and Phase 2 on a per household basis. If the development costs to be incurred by either the community or Mac and Sandy prove to be so large as to make the development of Phase 2 financially infeasible, we will explore other options for Mac and Sandy to get their money back out of the land. One of the options to be considered would be to go back to our original plan: the community keeps ownership of approximately 120 acres and Mac and Sandy sell off approximately 240 acres. If we were to pursue that option, the community would need to transfer ownership of approximately 83 acres to Mac and Sandy. The name of the community is Heartwood Cohousing. The name of the HOA is Heartwood Ranch HOA. The Outback refers to the land to the north of the cluster, currently owned by Mac and Sandy. Upon completion of the Phase 2 development, any Outback land not developed into Phase 2 lots will be deeded to the HOA. The names Phase 1 and Phase 2 will cease to be used following the development of Phase 2 to support integration of the two phases. All open space will be shared by all Heartwood Cohousing households. The following common facilities have been constructed at Phase 1’s expense and will be available to all Heartwood Cohousing households. All community members will be subject to our agreements related to how the common lands and facilities will be used. All ongoing costs related to maintenance, upkeep, taxes, etc. of the common lands and facilities will be borne by all members in an equitable manner. Phase 1 has paid for all costs associated with obtaining County Approval for Phase 1. Phase 2 will pay for all costs associated with obtaining County Approval for Phase 2. Phase 1 will be responsible for all government imposed road improvements up to the Phase 1 homes. Road improvements serving only the Phase 2 homes will be the responsibility of Phase 2. Phase 2 will pay for all Phase 2 development costs not addressed in this agreement. If it is determined that water, sewer, or other systems built by Phase 1 could also accommodate Phase 2, Phase 1 and Phase 2 will negotiate terms of such an arrangement when the situation arises. Mac will work with the community in the creation of the Phase 2 lots (see Responsibility & Authority section). We will consider locating the lots within the Outback and/or the current HOA open space. We will plan to create 14 lots in Phase 2, but the actual number of lots will depend on what the County allows. These 14 Phase 2 lots do not include any lots that may be created associated with farm housing flexibility (see below). Revising the number of Phase 2 lots to be created (from 14) will require a community decision. Additionally, the community may explore other alternatives and revise the number of lots so long as the revision alternative generates enough profit to be equivalent to 14 lots in a cluster. Any alternatives affecting County Preliminary Plat Approval must be decided before we receive County Conceptual Approval. Mac will collaborate with N-PAT (or special task force) to create flexibility with the County for possible future farm housing. We will try to get that farm housing flexibility created as soon as possible. N-PAT (or special task force) will be responsible for exploring farm housing options. Any decision to create actual farm housing will be a community decision. The community and Mac will work in a spirit of cooperation and trust to develop the second phase of our community. We will strive to meet the needs of the community, both Phase 1 and Phase 2 members, and the needs of Mac and Sandy. Mac will be responsible for planning and oversight of the Phase 2 development. The Steering team will be responsible for planning and oversight of all community functions listed in the Teams agreement. Mac and the Steering team will coordinate as needed in scheduling community decisions related to the Phase 2 development. Phase 1 teams will consider how resources they are responsible for will be impacted by the addition of Phase 2 and how to address those impacts. It is estimated that this will generate a 12 month total of approximately $68,500. 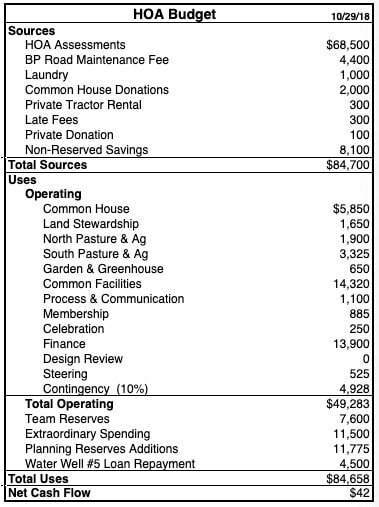 Consistent with the Operating section of the Budget spreadsheet dated 10/29/18 (above), the total 2019 Operating Uses budget will be $49,283. Specific team Operating budgets are detailed in the spreadsheet. Teams are authorized to spend their Operating budgets as they decide consistent with their responsibilities listed in our Teams agreement. C1 Team or task force with spending authorization is indicated. C2 Spending authorization is effective immediately and ends on December 31, 2019, unless otherwise noted. C4 The HOA will initially pay all costs of Covenants Revision work, which will likely exceed $4500. After the number of Phase 2 lots has been finalized, Phase 2 will reimburse the HOA for its share of the Covenants Revision work, as specified in the Phase 2 Agreement. The net cost to the HOA is expected to be $4500 or less. Spending authorization for the Covenants Revision work ends on December 31, 2022. The Reserve Cap for replacing the Common House roof will increase from $10,000 to $11,000 so it will be changed from a Team Reserve to a Planning Reserve. The current balance for that reserve of $4500 will be transferred from Team Reserves to Planning Reserves. Starting in 2019, the new Planning Reserve will be funded at $275 per year until the $11,000 Reserve Cap is reached. Annual contribution to Team Reserves will be $7600 per year starting in 2019 (was $10,000). This is in addition to operating profits that automatically get added to Team Reserves at yearend. We will pay back $4500 of the Water Well #5 Loan. $8100 of Non-Reserved Savings along with a $100 private donation will be used to fund the 2019 HOA budget.